Blurb: “A cold lonely life, paralyzed by sickening nightmares; that’s what Kewy, a young Irish teacher, started to experience. And then the abrupt knockings at her door established that the time has come. Things buried in her past, found a way to communicate with her- the dreams, which always receive her at a god forsaken place dwelled with evil and surrounded by death, fear and hopelessness. The past was agonizing but the part of her still believes she could erase it. In her quest, Kewy was joined by two concurring beings; both of which found a reason to live, in her struggle. Together the three walked through that dark, disturbed and desolated land. 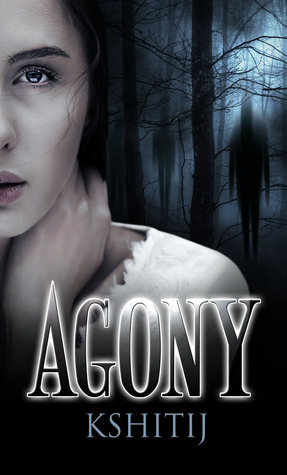 Though it says Horror, Agony is really an occult/supernatural experience. It does have ghost elements in it but as a die hard horror fan, the fear-factor in this novel is more psychological than anything else. There are scenes of cult practices as well as some where people drink blood and stuff, but I didn’t feel it to be too gory. The horror is the right mix between psychology and gore. The main character, Kewy, felt shallow to me in the beginning. She is plagued by nightmares and can’t sleep and must embark on a journey to the place where it started. She convinces one of her students and a potential boyfriend to go on that journey with her, even though she knows how dangerous it can be. Then, she refuses to tell them how it all started till the time they reach the point of no return in an isolated resort in the county. However, it was heartening to see her growing better as a person throughout the story since that is what a story is about, how a character changes due to circumstances. Kewy’s college friends were also a bit of a let down. They all go on a professional escapade but once they reach their destination, nobody is interested in doing the actual work anymore. Kewy’s other friends, Eineen and Kasper were well thought-of and sketched. Especially Eineen came across as a real strong person. The plot is great but the telling of the story is a bit lacking and so the reader has to plod through unnecessary information to reach the actual story. Everything, and I mean everything, has been described to the minutest detail, leaving absolutely nothing to the reader’s imagination, as if the author doesn’t trust the reader to ‘get it’. The language needs professional editing. I wish authors like Kshitij who self publish their novels would first hire the services of a professional editor, especially if it’s a debut since the first impression you make on a reader would carry forward in their minds. I did enjoy reading Agony once I went past the language barrier and I think the plot has the right bit of depth and intrigue. I especially liked the climax and the ending where good wins over evil. I would rate this story 3 out of 5 stars.